New Orleans jam outfit Galactic has announced 2018 tour dates for North America. The group will be joined by the Greyboy Allstars or Turkuaz at select shows. The new concerts are in addition to Galactic's previously planned appearances through the remainder of this year and into January of 2018. The performance schedule kicks off on February 15 in Boston, Massachusetts and extends until the end of March. The band concludes the tour alongside Turkuaz for shows in Los Angeles and San Francisco. When do Galactic 2018 North America tickets go on sale and what is the presale code? The general public on-sale begins as early as October 20, 2017 at 10 AM. Artist presales are currently underway. Citi cardmember, American Express cardmember, Live Nation, Live Nation Mobile App, and local venues / radio presales will follow. For the Artist presale, you can purchase tickets through Galactic's website. For the Citi cardmember presale, you can use the promo passcode 412800, and for the American Express cardmember presale, you can use the promo password INGOLD, but you will need a Citi or American Express card to complete your purchase. The Live Nation presale offer code is APPLAUSE and the LN Mobile app password is COVERT. Keep in mind, each date is different and details are subject to change. 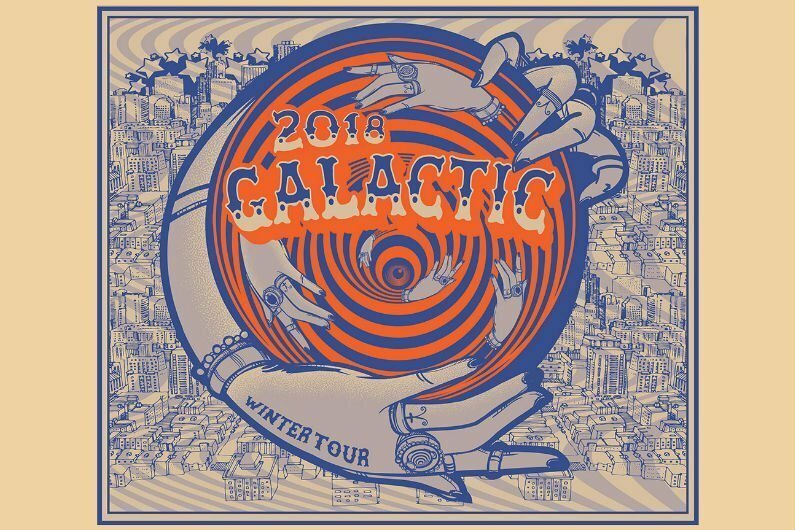 We recommend following Galactic on social media and signing up for their free email newsletter (top right of page), in addition to checking your local venue’s social media and email subscription service, to get the most up-to-date information. Purchase a copy of Galactic's 2015 release, Into The Deep, on Amazon. For more, check out Galactic's Zumic artist page.